Whether you’re happy with the equipment in your bag or not, I highly recommend taking advantage of the fact that manufacturers send representatives around to golf courses to market their wares. I don’t know too many private citizens who own the kind of equipment that these folks drag around with them from course to course to measure all the factors of one’s game, so why not take advantage of it—for free—when the opportunity presents itself? These people genuinely want to help your game. They want to help it by selling you products manufactured by the companies they represent, but they are extremely knowledgeable and are being paid to share that knowledge with the public (in an attempt to sell equipment, obviously). Having said that, there’s no reason not to attend these events at your local course(s) when they’re being put on just because you aren’t in the market for anything at that time or don’t really care for that particular brand, because you can get a ton out of going, even just for a few swings. 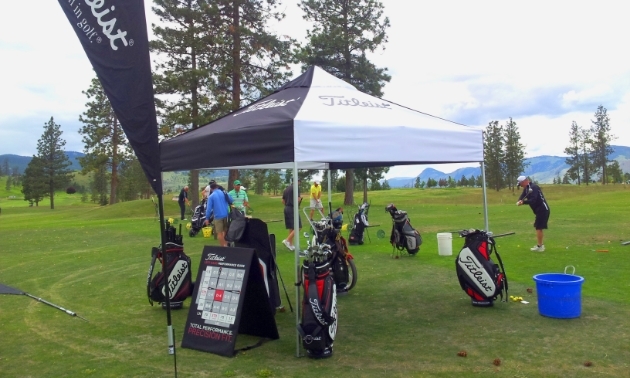 I recently attended a Titleist club fitting at a local course, for example. I don’t play Titleist equipment, and I have no intention of switching my brand anytime soon. I was, however, interested to see what my current swing speed, impact, and trajectory numbers are and to see if they had a 3 hybrid that I liked the feel of, as it’s about time to replace the one that’s been in my bag for a half-dozen years. The Titleist who that was working with me, switching club heads onto different shafts and explaining why as we were tweaking my impact, was—simply from a personal, knowledge-gaining perspective—great to deal with. He was analyzing the numbers the launch monitor was giving him on the fly and getting different set-ups ready for me to try in an attempt to improve the results as we progressed closer to some previously-unrealized ideal, and was explaining to me all of the factors that go into those tweaks, which, even without buying the ideal club that we came up with at the end, I think will improve my ball striking. I might actually give Titleist my replace-my-hybrid money after all, just for the knowledge that I was given and the treatment I received at this event. If I do, it will be when their next model comes out and the current one (that I’m now all spec’d up for) goes on sale, and it’s not a sure thing, but it’s a possibility. We all want to be better at this game, and the way we do that is by getting accurate information about how we play, be it from our scorecards, our ball flight, whether we are in pain the day after we play, or the hard data that comes off launch monitors being analyzed by professionals.